At long last, I just uploaded my first ever Killer Samurai Sudoku. As all our other puzzles – it’s PERFECT ;). Why: 1. It has one and only one solution. If you claim differently – triple check all the rules that apply. 2. This solution can be found by logic only – no trial and error is needed. 3. It’s symmetrical. (Killers are 2-way symmetrical, while other overlapping puzzles can be made 4-way or 2-way symmetrical) 4. There are no singleton cages. This puzzle should take you through the weekend. Let me know how difficult you find it. UPDATE: I moved the puzzle and attached it to this message. The first step (innies and outies) in solving it is here. I’ve also published several Killer Samurai Sudoku books. Check them out! This entry was posted in Free sample puzzles, Killer Sudoku, Samurai sudoku and tagged BOOK, books, innie, INNIES, innies and outies, killer, Killer Samurai, Killer Samurai Sudoku, outie, OUTIES, PERFECT, rules, samurai, Samurai Sudoku, sudoku book, sudoku books, UPDATE. Bookmark the permalink. Post a comment or leave a trackback: Trackback URL. I can’t find where to download Killer Samurai for Dec 16. What do I click on? Took me a while to solve it, but was pretty straight forward, just LONG…. BTW I can’t see the symmetry…. Merry X’mas & Happy New Year to all! 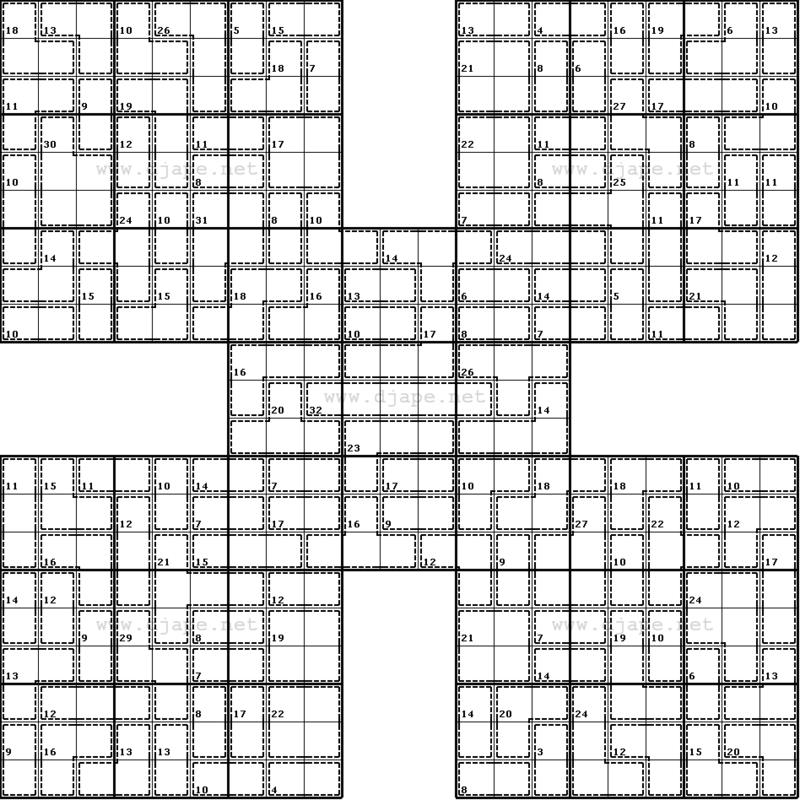 ArgonO, yes, the puzzle is 2-way symmetrical (diagonally symmetrical, to be precise). So, if you cut it on the diagonal and rotate one half by 180 degrees you will get the same shape as in the other half. All Killer Sudoku puzzles posted here are symmetrical in the same way. I had to resort to possible sums more than a few times, but I got there in the end.